It's been a while. 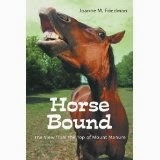 I thought a break from the blog would help me stop whining about all the craziness in the horse world. It did not. I did luck into some wonderful wines, however. Today I'm here to share two things. Or three. I'll count later. 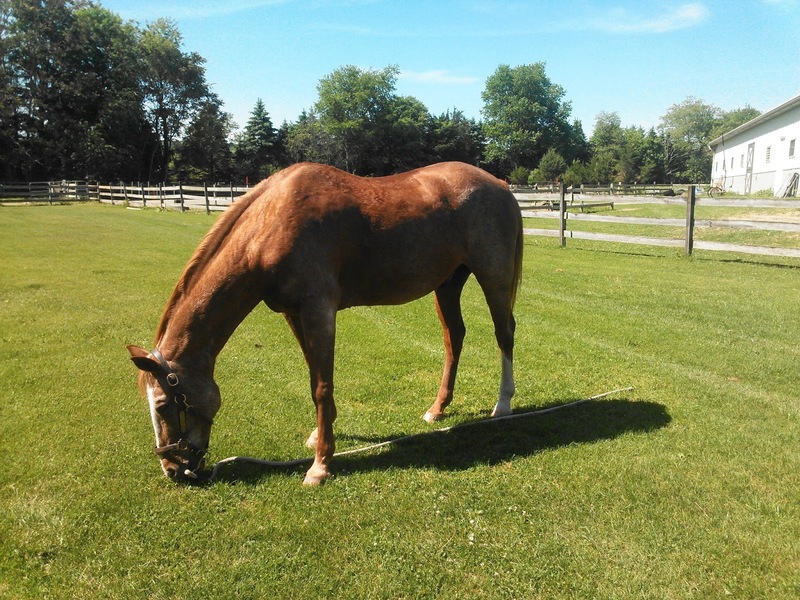 The last post I wrote was about recovery and not rushing your horse (or yourself) through the necessary baby steps that work to make for a sound outcome. I recommended taking your time, working back slowly even though it appears on the surface that a few steps could easily be skipped. Most recently I've been dealing with results on both sides of the recovery coin. On one side is the 31-year-old Quarter Horse whose bout of neurological Lyme Disease seemed destined to signal his last hurrah. His back and neck had become twisted. He was able to walk, but preferred to stand with his hindquarters pushed against the fence or the wall for stability. If you've never seen a neuro problem in a horse, as I hadn't, this can come as quite the surprise. Still pictures don't do justice to the mobility issues he faced as the vet (Christopher Fazio, VMD), the acupuncturist, and I worked to get him past the illness and on the road to recovery. A month of doxycycline, muscle relaxants, injections of scopolamine and B12 along his spine, and several relapses later, he's back to being the picture of health. Come spring, when he shed out his gray winter hair, he'll look as he did in the "before" pic above. The entire process, including some mild under-saddle and in-hand work to build his back muscles, has taken roughly a year. The lesson to be learned from this is that there's no single approach that works perfectly, and there's no rushing success. He suffered three relapses, the last in October of 2015, before coming back to full (elderly) health. The picture at the top of the post is Leo today. Hairy and gray, but in fine fettle. Four months ago he barely had any fettle at all! But he wasn't the only horse who had issues last winter. 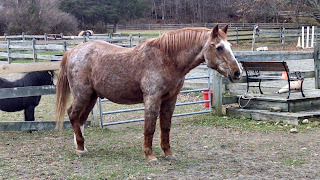 The big Paint, Zip, suffered a bout of laminitis possibly connected to an illness. He, too, got a month of doxy plus treatment for his feet, and he came around beautifully. Being younger (he's coming 20) he rebounded much more quicly than old Leo could hope to. I thought we were done with the bad stuff. I was wrong. 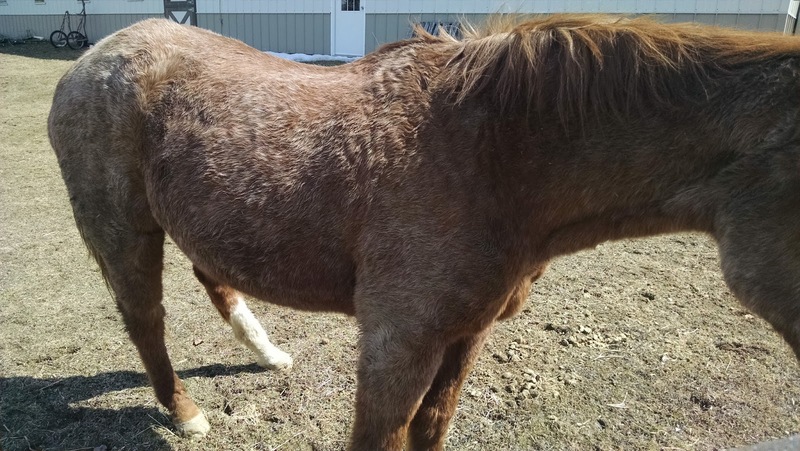 He'd returned to full soundness within a couple of months and was back to light walk-trot work, only to develop some gravel between the hoof wall and sole that created a perfect abscess track. There's nothing like a stubborn abscess in the hoof of a stubborn horse to give an owner pause about ever doing the horse thing again. I now own even more back supporters and kinesiology tape than I thought possible. On the positive side, I found a product that I will never again be without. 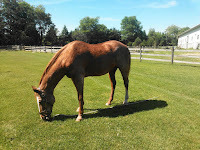 All Natural Horse Care, Canada, sells European-made horse boots. Specifically, they sell boots that can be used for riding and for turnout as well. That latter was my salvation. This is the boot that saved my sanity and Zip's right front hoof. He's not standing awkwardly. 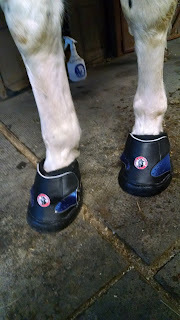 He was showing off his boot and I caught him just putting his hoof back on the floor. I upgraded from the Ultra to the Ultimate, which is what is shown here. The Ultra Equine Jogging Shoe is fabulous and comes with inserts for founder as well as regular gel insoles. 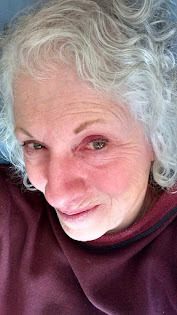 But I found that arthritic hands and straps-and-buckles are not a good match. So when the Ultimate was released, I jumped right on it. This is all-velcro all the time! That means I can quickly remove a boot, check the hoof under it, disinfect, treat...whatever. Then the boot goes back on as easily as it came off, which is pretty darned easily. These boots are wonderful for poulticing. Just add the poultice mix of your choosing to the boot before you close the velcro or use a catheter syringe to squish it into the boot after it's entirely on. I can't say enough nice things about this product! I tried others. I won't write about them here because I try to avoid completely negative reviews of anything that might work for someone else. But you can believe me when I say that of all the options, this proved to be the best. They're not cheap at over $200/pair, but they are sturdy enough to last for years under normal wear and tear. Zip's been wearing these for almost a month (with breaks for airing out of everything) and they are like new....dirty, but like new otherwise. That's all the news for this week. Next time I'll get into a book I recently read--two, in fact--that you'll surely want to have on hand.